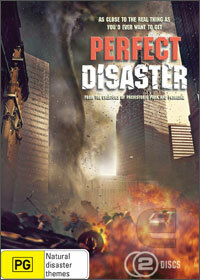 I must confess a fascination with severe weather and disaster movies. This ABC DVD presentation of the 2006 Discovery Channel/Impossible Pictures docu-dramas is very interesting. It takes six cities from around the world and takes potential bad natural phenomena to the extreme, as it were. Sydney fire-stormed, London flooded, Hong Kong typhooned, Dallas super-tornadoed, Montreal ice-rained and New York undergoes a “geomagnetic storm”. Each 45min episode opens with one ‘hero’ who usually has a family and is professionally-connected with the disaster about to unfold. This adds a layer of schmalz that I found distracting and kept wishing away. The production values are relatively high. For example, local casting is used: the Sydney episode had familiar accents and locations! Some of the special effects are a bit ambitious and come out looking cheesy, which is a shame. The sound is Dolby 2.0. The tone of the show is slightly alarmist, not helped by narrator Michael Carroll’s sometimes hysterical enthusiasm. I am also a fan of the 3D moving schematic graphics which explain what is going on in the atmosphere or environment. They help the viewer visualise complex phenomena like why the cold, dry air from a super-cell falls and creates a downdraught which can be dangerous for airplanes—neat! One annoyance has to do with the packaging which has ABC Shop products on the inside sleeve instead of telling you which three episodes are on the first disc, and which on the second. This seems a bit careless towards buyers! I love this sort of thing and wouldn’t hesitate recommending it to anyone who has the slightly inclination toward disaster genre or apocalyptic visions!